Coach John Wooden, irreplaceable in American life. God bless your soul. You shall be missed dearly, and we shall remember your lessons. On May 26, 2010, “[f]ormer UCLA basketball coach and Hall of Famer John Wooden [was] hospitalized at Ronald Reagan UCLA Medical Center” for dehydration. 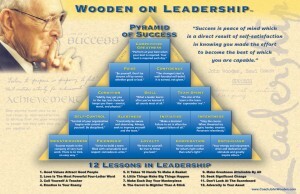 Coach Wooden is most well-known for his Pyramid of Success, an autographed copy of which is cherished possession of Gov. Palin’s. Indeed, that Pyramid may be the bedrock of Gov. Palin’s Transformational Leadership skills. Both Gov. Palin and her husband Todd revere Coach Wooden as a hero, and today June 10, 2010, Gov. Palin expressed her get well wishes in a Facebook Note posted 11:14 EDT. Ever since we were kids, Todd and I have looked at Coach John Wooden as a true hero. His quotes plastered our bulletin boards, school notebooks, and locker doors. Realizing this mutual admiration of Coach Wooden when Todd and I first met about 30 years ago was a sure sign that we were on the same page. From afar we have admired Coach’s wit and wisdom, we’ve absorbed his writings and the life lessons he’s taught from the basketball court. Coach’s “Pyramid of Success” is a blueprint that everyone in this country should tack within eyesight and try to follow daily. Coach teaches: “Material possessions, winning scores, and great reputations are meaningless in the eyes of the Lord, because He knows what we really are and that is all that matters,” but I admit I fail that material possession lesson as I prize a favorite one that’s displayed in our living room – a genuine autographed copy of his Success Pyramid. Feel better, Coach Wooden! You are God’s gift to those who recognize value in life lessons learned in the arena of competition. In the midst of all your success on the parquet you’ve reminded us what really matters. You remind us to be courageous and optimistic and prepared. Truly, you are a gift on this earth, and our world needs you to keep on giving! 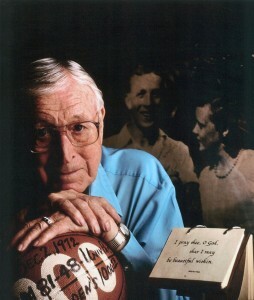 Coach John Wooden was an inspiration to Governor Sarah Palin and her husband Todd Palin as teenagers. His Pyramid of Success can be found on his website. A printable version can be found here. Sterling qualities that Sarah and Todd have adhered to. In her Facebook Note, Governor Palin expresses her admiration of Coach Wooden and her appreciation of the “life lessons he’s taught from the basketball court.” She also sends him a “feel better” wish.